in Social Media with tags Henrik Lundqvist, Hockey, Los Angeles Kings, New York Rangers, NHL, Stanley Cup Both comments and trackbacks are closed. Last week, the Los Angeles Kings clinched the NHL Stanley Cup Finals with a Game 5 win over the New York Rangers. The series was marked by extremely close games – three went into overtime – and an intense bicoastal rivalry in which even the teams’ respective social media managers got involved. 360i’s Insights & Planning group analyzed conversations during the five-game series to dive deeper into how the matchup played out off the ice in social media. Below is a summary of their findings and how marketers can apply these insights to their own programs. Who won the battle of the buzz? In addition to their victory on the ice, the LA Kings also took home the battle of the buzz. Kings-related chatter accounted for 61 percent of Stanley Cup Finals conversations analyzed, compared to 39 percent of conversations taking place about the New York Rangers. This isn’t too surprising, since the Kings won four games in the series to the Rangers’ one – and eventually took home the coveted Stanley Cup trophy. 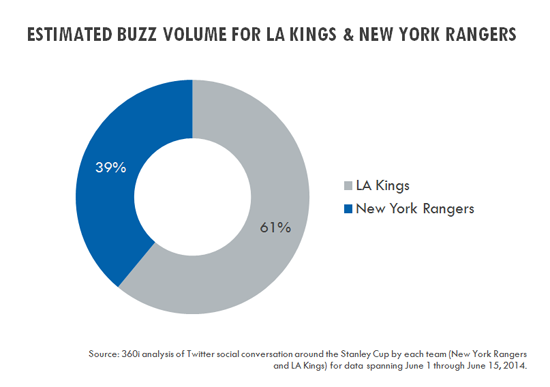 Marketer Takeaway: Although the Rangers’ combined social following on Facebook and Twitter is 35 percent larger, their voices were drowned out by the more passionate Kings fans. Just like in sports, brands stand to own a disproportionate amount of conversation in social if they’re able to please fans, especially around big cultural occasions. During the series, New York Rangers goalie Henrik Lundqvist (an athlete who is well-known for his social media savvy) captured the most conversations with nearly 80,000 mentions. Coincidentally, this king of social media is also nicknamed ‘The King’ by the Rangers faithful. The next five players each came in at under 25,000 mentions a piece and all hailed from the LA Kings roster. This gap in buzz is likely due to Lundqvist’s heroics throughout the series – despite the Rangers dropping four games – and the lack of an offensive standout on the Rangers which kept their individual players out of the next five. 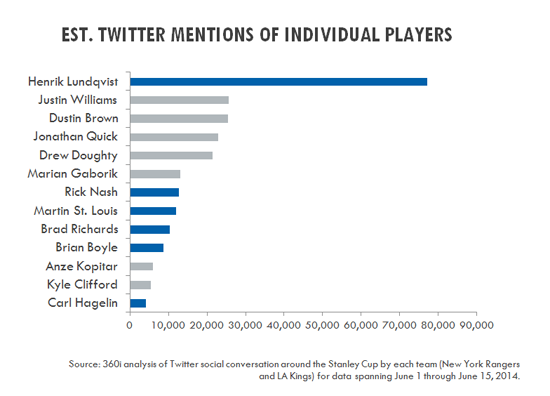 On the whole, the LA Kings players were more likely to be mentioned on Twitter than the New York Rangers players. Marketer Takeaway: A hero will always capture attention despite broader trends working against them. Modern brands are increasingly trying to take a stance in culture by championing or standing against societal undercurrents in today’s world. Dove did it by standing against misconceptions of beauty, 360i client Smirnoff did it by calling out exclusive and pretentious vodkas – thinking of your brand, what proverbial dragon can you slay to be the hero for your consumers? Just for fun: Which fans curse the most? 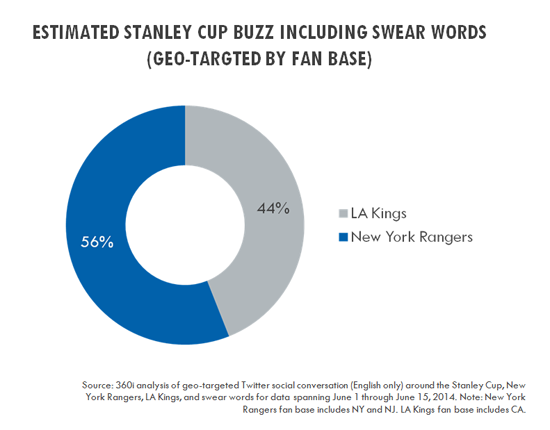 True to the stereotype, New York fans accounted for 56 percent of all curse words related to the Stanley Cup Finals versus Los Angeles fans’ 44 percent share – this according to a geotargeted analysis of tweets mentioning the teams and/or series in addition to a selection of key swear words. Marketer Takeaway: While it might not make sense for brands to align their social tone of voice with the exact habits of their fans (especially in the case of New York Rangers fans), it is interesting to analyze the differences in language and tone across audiences and apply those to your content strategy. When establishing a social tone of voice for your brand, use sentiment insights into how your fans talk about your brand and to each other to develop a relatable and relevant brand persona. For marketers, the hockey rink might seem like a strange place to find inspiration, but brands can learn a lot by monitoring how audiences react and respond to live events (like the Stanley Cup) – and then use those consumer insights to inform their ongoing social media content strategies. Research was conducted by Lia McCaffery, Analyst, Insights & Planning and Preeti Desai, Manager, Insights & Planning at 360i. Fitz Maro, Associate Strategist at 360i, contributed to this report.